We have developed a policy development process (PDP) which is designed to be bottom-up and consensus-driven. This means that any stakeholder can request a policy change and, if there is consensus among stakeholders, the policy change can be implemented. The Board of the IE Domain Registry (IEDR) established a Policy Advisory Committee (PAC) in 2014 to consider and provide advice on policy issues concerning Ireland’s Internet top-level domain, .ie. The Policy Advisory Committee operates in line with the Policy Development Process (PDP) and recently held its inaugural meeting to discuss proposed policy changes relating to the release of one / two letter domain names, Internationalised domain names (IDNs), and the re-sale of the right to use a .ie domain name on a secondary market. Every registry in the world has a set of policies which determine how it operates and engages with its stakeholder community. The most important policies are known as the Registration and Naming policies. Others include policies on privacy, Whois acceptable use, managing deletions, and non-renewals. Ireland has developed a policy development process (PDP) which is designed to be bottom-up and consensus-driven. This means that any stakeholder can raise request a policy change and, if there is consensus among stakeholders, the policy change can be implemented. The diagram below sets out the 10-step PDP. Fill out the Policy Change Request Form and send it to pdp@iedr.ie. Your proposal will be reviewed by the IEDR and the PAC (Policy Advisory Committee). If your proposal is accepted a Working Group will be formed by the IEDR and the PAC. Depending on the nature and complexity of the proposal, the IEDR and the PAC will determine if a public consultation is required. If necessary the Working Group will prepare a questionnaire for the public consultation. The Working Group will prepare a report based on the results of the public consultation and/or the Working Group meetings and discussions. The report will be sent to the pdp@iedr.ie mailing list in order to collect feedback and comments from the Stakeholders in order to reach a consensus. Consensus must be reached for the proposal to progress to Step 8*. Once consensus is reached, the proposal will be submitted to the PAC* who may recommend acceptance to the Board. If accepted by the Board, the policy change is approved for implementation. The policy change can now be implemented by the IEDR. 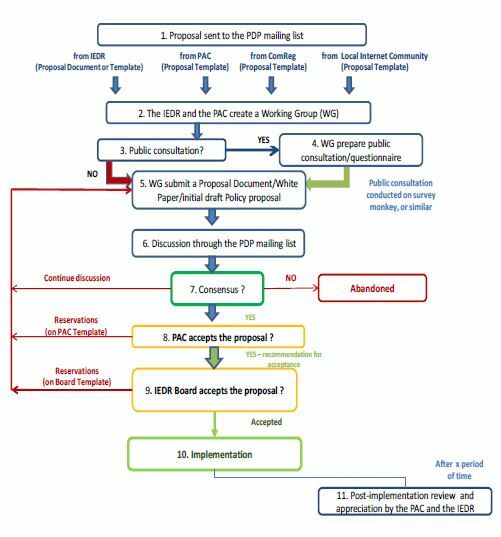 * Please note that for steps 7, 8 and 9, if consensus is not reached or if there is an objection from the PAC or the Board the proposal goes back to the Working Group. They will then review the proposal in order to make it acceptable. If consensus cannot be reached, the proposal may be abandoned. To submit a policy proposal please download and complete this Policy Proposal Template before mailing it to pdp@iedr.ie. The IEDR will publish all proposals, outcomes and IEDR Board decisions here in due course. In December 2010, the IEDR announced the formation of a Working Group with stakeholders. The objective of the group was to develop a formal Policy Development Process (PDP) for the .ie namespace. The PAC may convey advisory views or submissions on policy matters to the IEDR. All advice given by the PAC will be objective and in the best interests of the Irish Internet community. The PAC shall be autonomous in regard to its agenda and the subject matter of its policy advisory recommendations. The IEDR may refer any policy issue to the PAC for its consideration. Recommendations of the PAC shall be of persuasive authority and IEDR shall have due regard to them. The PAC may regulate its activities as it sees fit in accordance with the ToR. The Working Group met and created an initial draft proposal which was sent to the PDP Working Group mailing list in February 2011. The proposal was subsequently edited and refined over a number of iterations with stakeholder feedback. Following this detailed consultation process, the dedicated working group reached consensus on a new PDP, which went ‘live’ on 31 May 2011. Please do not hesitate to contribute on the PDP mailing list. Send an email to pdp-subscribe@iedr.ie. When you receive our reply, you can then post your comments/suggestions/feedback to the entire mailing list at pdp@iedr.ie. Since November 2002 the IEDR have consulted with the Local Internet Community on a number of important policy issues and other matters of procedure, process and practice. These consultations were informal in nature, but were designed to obtain stakeholders’ views on matters that impacted them, in the context of their roles within the Local Internet Community. In late 2010, the IEDR launched a process to develop a formal Policy Development Process (PDP). Please note that the term “resellers” used above refers to the IEDR’s group of Accredited Registrars. This terminology was changed, by formal agreement, in 2010. The IEDR Policy Development Process is further detailed in this document.